We will have a CTC workday at Beaver Creek Reservoir Saturday, December 8, at 9:00 am. We will remove several trees that have fallen over the trail, work on improving the trail in some muddy areas, and carry a bench down the trail to place on a point overlooking the reservoir. Meet at the parking lot on the right side of Browns Gap Turnpike immediately after crossing the dam. Wear sturdy shoes or boots, work gloves, and warm clothing. Bring your own tools or use ours. 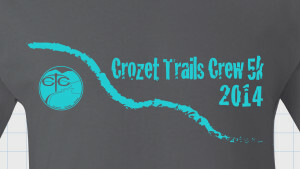 Check our Facebook page at https://www.facebook.com/Crozet-Trails-Crew-195317697171781) after 8 am for news of possible weather cancellations. Announcing our race for 2018! The Kids Run course: The kids run (for kids aged 1 to 7 years) will start at the 5K start line (just south of the soccer field) and will be run around the soccer field so that the kids will be visible from the field at all times. 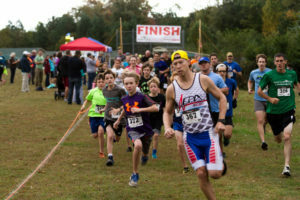 Parents are welcome to run/walk with their kids. 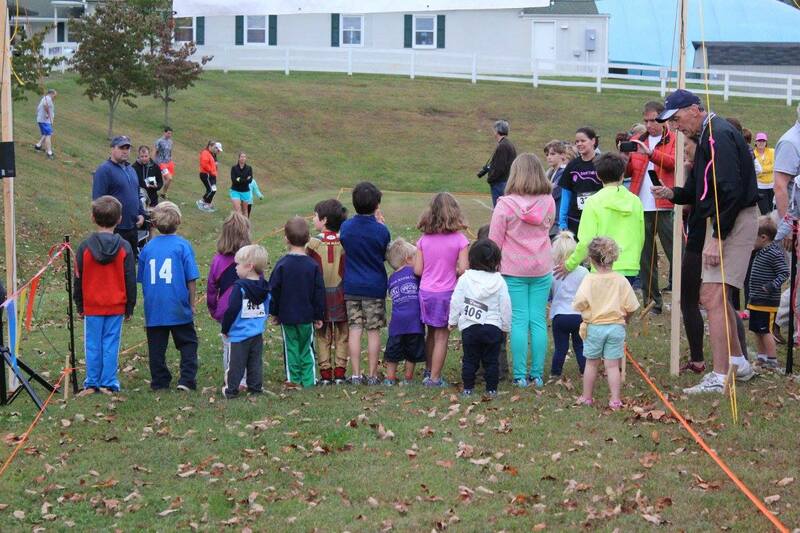 No fee for kids run, but please include their info on the registration page (see below). 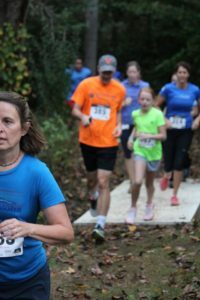 1-day-only access to the Crozet Connector Trail (Thanks to the property owners who have granted 1-day race access). 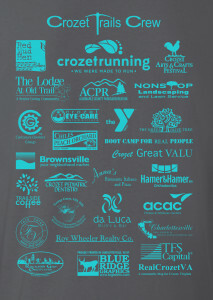 Race shirt and prize give-away eligibility ($20 value). Entry into the Crozet Arts and Crafts Festival for the day ($6 value). Overall male and female winners of the 5K race will have a trail bridge named in his/her honor (PRICELESS). 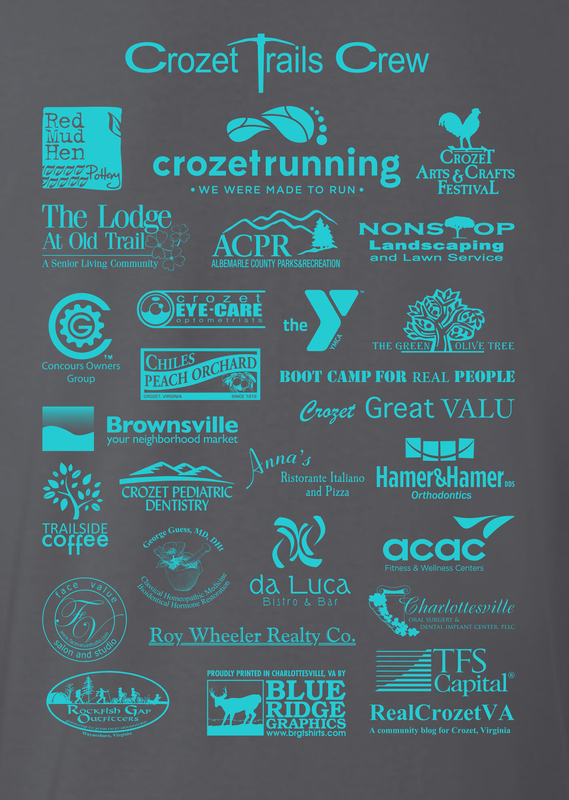 $20 on-line, $25 Friday October 5 (6 p.m. – 8 p.m. at Crozet Library parking lot) and day-of race. Support the work of The Crozet Trails Crew (CTC), made up of community members who are interested in helping plan, build, and promote pedestrian and bicycle trails in and around Crozet, Virginia. and sponsored by local businesses. We are also preparing for the Independence Day celebration on June 30. 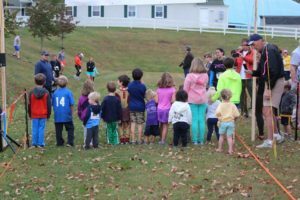 Sign up here to sell beer and show up at Crozet elementary by 4:30 that afternoon to walk in the parade. Our monthly meeting will be at 6:30 on June 28. Come and meet the Crew! Summer weather has struck — We need help mowing and trimming the trail between Western Ridge and Lickinghole Basin! Meet at 9:00 a.m. on Saturday on Lake Tree Lane, just past the intersection with Vista View Lane. 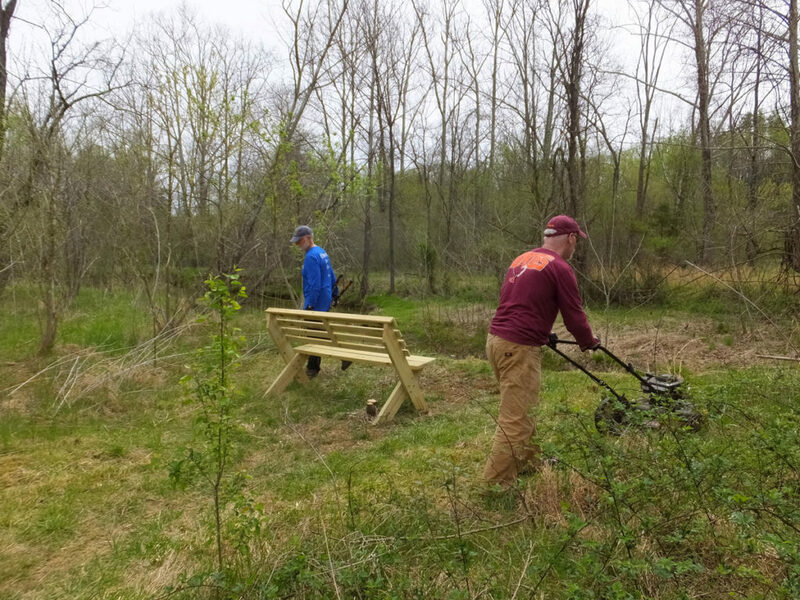 We’re looking for anyone willing to push a mower or operate a string trimmer, plus people to clip and prune branches and vines along the trail. We should be done in about 2 hours. Wear sturdy shoes and a hat. Bring water. Long pants and insect repellent are recommended. Bring your own tools or use ours.